While I was offline for Thanksgiving Three Irish Girls put up their winter lookbook. It’s a beautiful book of their new colorways and patterns – and I have a pattern in there! My Aperture Knee Socks pattern is available for purchase through their website. 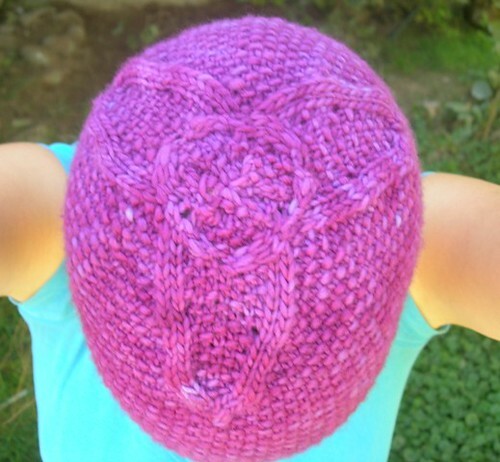 Of course you can also see details and add it to your queue on Ravelry. Inspired by the swirling filigrees found in Art Deco designs, Aperture features twisting stitches that spiral in opposite directions. A plain stockinette sole and calf shaping ensure these socks feel as amazing as they look. The pattern includes specific directions for working the short row toe and heel as well as the picot cuff. The cuff is turned and sewn inside which creates a perfect little place at the top where you could hide some elastic to help keep the socks from drooping. That said the stretchiness of the lace, along with increase below the calf and decreases above, all combine to keep the socks from being droopy even on their own. These socks are the project which, way back in September, I estimated to have approximately 4398 ssk maneuvers. And yes, that means about 4398 k2tog’s as well since each sock spirals in a different direction. I overcame the desire to stab my eyes out with my DPNs (which would have been deadly, since I was working with signature stiletto tipped US 1’s) with a handy trick I thought I’d share. On the work even rows, there’s one between each set of decreases, I wrapped the yarn in the opposite direction as I knit. This means all those stitches were essentially sitting backwards on the needle. In other words, already in the orientation that the “slip, slip” part of a ssk sets up. So then, I just had to knit them together through the back loop on my decrease rounds, not having to work all those extra “slip, slips” probably saved me hours of time! I did this for the stitches on the top of the foot, and all the stitches except the faux seam in the leg, and I highly recommend the technique! The random number generator says that the 7th response to my free yarn drawing wins! That’s Conor, so Congratulations Conor! I’ve sent you an e-mail! 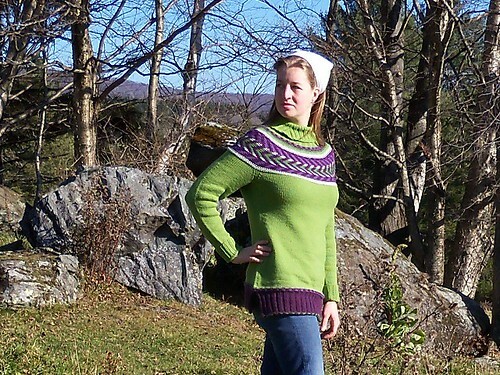 The pattern is in the New England Knits book, but also in IK Fall 2010, which is where I found it. I made the crown about an inch longer then the pattern called for. This is because, like several other commenters, I really like a winter hat to fully cover my ears. Of course not everyone chose their newest hat. And those people who didn’t frequently mentioned one of their oldest, even if it’s not perfectly done, or not even hand knit. Whatever your favorite winter hat is, it’s certainly hat season – at least in the northern hemisphere. So yay for hats! I won’t be online for the next few days. Thanksgiving is a time for me to visit with my whole, huge, extended family. No, really, we’re expecting around 50 people for dinner on Thursday – luckily we have our feast at a neutral location! 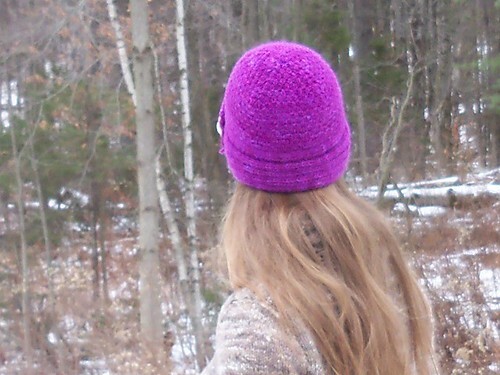 This yarn is hand spun by me and leftover from my Asters hat pattern. 128 yards of heavy worsted 2 ply yarn, enough for most hat patterns. 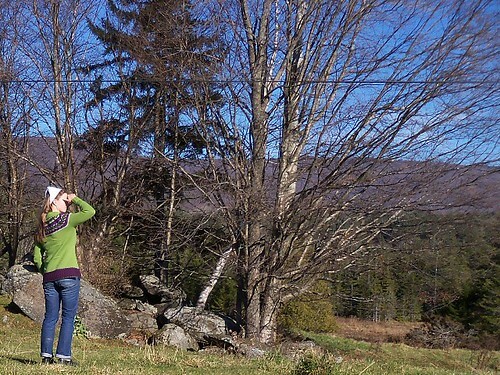 The fiber is September Pastures, a 58% dorset lambswool, 36% mohair, 6% alpaca blend from Mountain Fiber Folk. 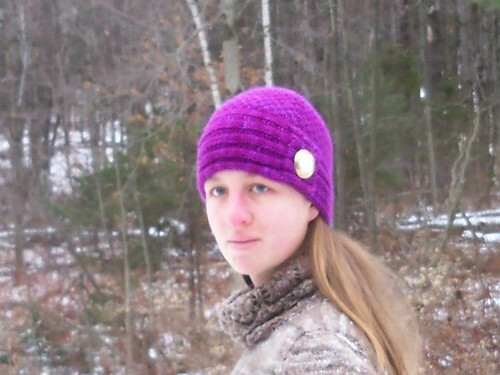 To win this yarn, and a copy of my Asters pattern, just leave a comment on this post telling me about your favorite winter hat. Make sure the e-mail address you leave when posting is a good one, that’s how I’ll contact the winner. I’ll draw a winner using a random number generator Monday 11/29 at noon EST so you have until then to enter. One entry each, please play nice! I really want to show you all the baking I did over the weekend! See?! Isn’t that impressive? I’m pretty pleased, and clearly so is Neil! 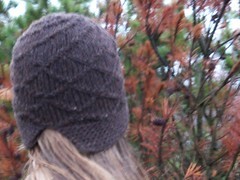 Last night I finished a new hat, and also The Hunger Games. Knitting the one while reading the other means the two will forever be intertwined in my mind. 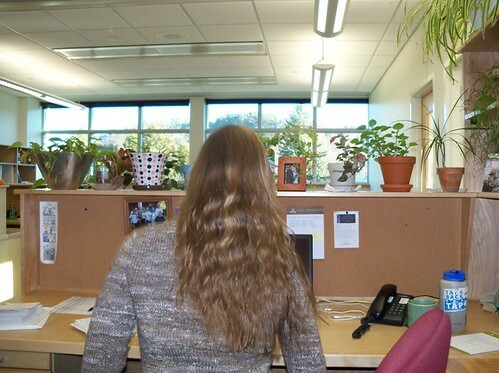 Seriously, my juno sweater still reminds me of Battlestar Galactica every time I put it on just because I knit both sleeves while watching those first mini-series episodes back-to-back-to-back the whole way through. And it’s not even remotely sci-fi. Anyway, I’m pretty pleased with this hat too! 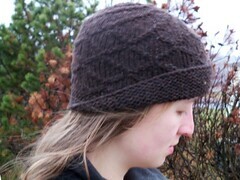 The yarn is Brooklyn Tweed’s Shelter, in pumpernickel. 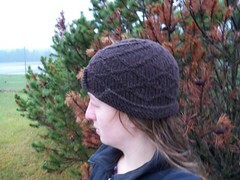 I picked up two skeins in Harrisville this summer, and this hat took less then one. I made up the pattern as I went along. I was trying to get Neil to name a batch of beer he brewed Dunkel IPA – because it’s a dark IPA beer, dunkel = dark – it made sense to me anyway. But he didn’t want to, so I’m using the made-up word myself! I really kinda like the notch in the brim. What do you think? I’m hoping Neil likes it too, because I’m thinking this is a good hat for men. It can be worn with the brim up, down, or half up and half down. I think that makes it versatile, but there’s always the chance he’ll think it makes it silly. Also, taking clear photos of dark hats early in the morning – it’s hard! I think someone loosed some gremlins on the system today. It’s not just computers either, although so much of my work is computer based that’s where I see their effects the most! Yesterday I spent the WHOLE DAY on the couch reading Hunger Games and knitting. I’m about 75% of the way through the book (and through the new hat I’m knitting too) and it turns out I don’t really want to do anything else until I finish. And yet the real world demands I do. The day before I baked and baked. 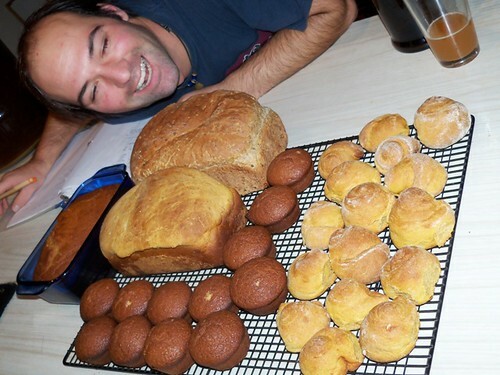 I made a pumpkin coffee bread and some sweet rolls out of the same dough. I also made a heavily spiced pumpkin quick bread and some muffins out of that same batter. I made a yeast-based beer bread too. Then I had to stop because I was all out of sugar. By the time I’d gotten more sugar the momentum was broken. I’ll make pies on Wednesday instead. In between, while things were baking and/or rising I did find time to work on a sweater, a stranded color work sock, a lace shawl, and a handspun beret. I didn’t leave the house much this weekend though. I can be very productive when I don’t have to spend time traveling. But no pictures, because of the gremlins. I have a plan. It involves some deliciously red yarn, a pair of old, worn out, and very comfortable boots, lots of math, some wet felting, and some needle felting. I finished my green and purple sweater last week! But then it needed to block, and then it was too dark to take photos. And then I did take photos, but got sidetracked. Anyway, here it is! I really love this sweater. The pattern (Orange Pop) is so well written I only changed ONE thing. I made the sleeves longer. Too much longer, as it turns out. I wasn’t expecting to have to fold the cuffs back to wear it. But still, I’d rather have them too long then too short. I also changed the color (obviously). I really love the green and purple together. I think adding more green and more purple were the perfect way to resolve the initial problems. 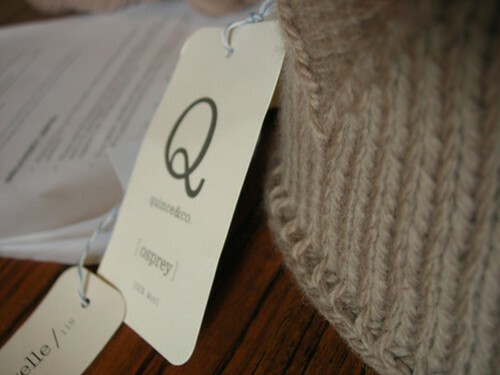 I really can’t say enough good things about all the yarns I’ve used from Quine & Co. I know I’m starting to sound like an advertisement, but I just can’t help it. The Osprey was fabulous, this Lark is squooshy and has AMAZING stitch definition. And the chickadee (that I got by surprise with my lark purchase) is begging to be made into a cabled set of hat and fingerless mitts. 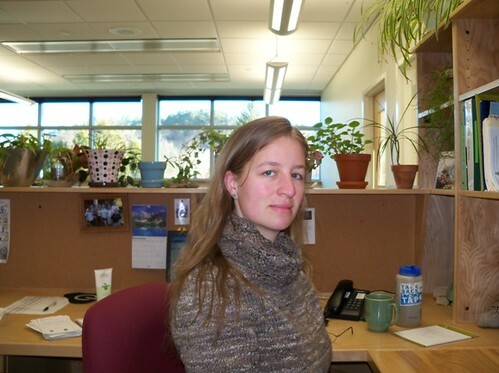 The day I took these photos also included me in the kitchen, splattering rotten egg** on my brand new sweater. After which I could be found huddled over it in the laundry room with a thingy of shout stain remover muttering “blot, Blot! Don’t rub!” But the good news is the sweater survived unscathed, even if it did get a second blocking in a single week. *possibly because I’ve only been once, and don’t really have that much to compare it to anyway. photography by Jane Heller, pattern Trefoil by me! 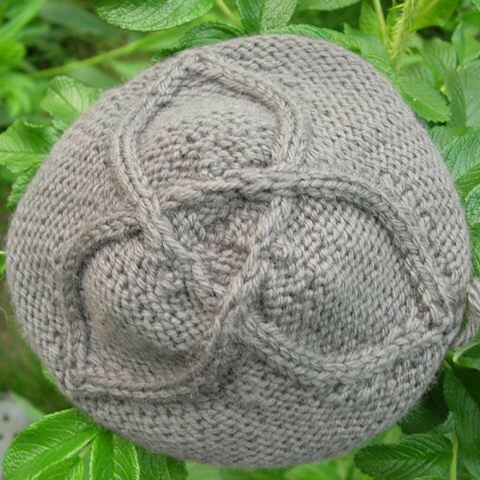 Trefoil is a cabled winter hat and mitten set with an elegant three pointed celtic knot on the crown and a single leaf of the knot mirrored on each mitten. The knot is framed by arching stockinette and trimmed with stretchy i-cord edging. 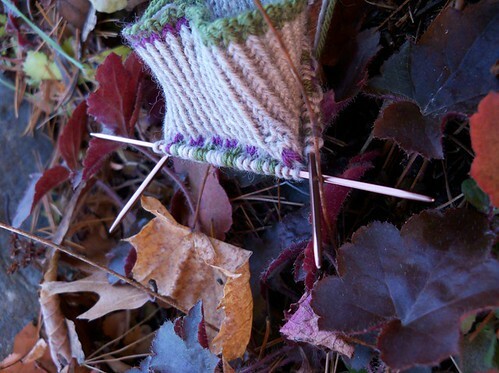 This story becomes a lesson in “why knitting other people’s designs is a good thing” for me. 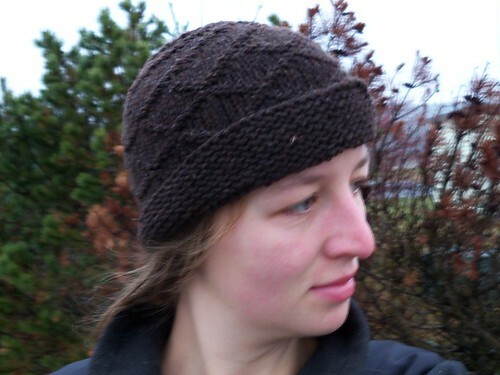 It never occurred to me to try a top-down hat until I was knitting one by another designer. I realized that this approach would allow the crossovers to flow much more smoothly, but I worried that the first cables would bow out, downward, instead of directly across. Taking a page from another greater designer then myself I thought that cabling every row might give the horizontal cable look I needed. After knitting this one little swatch in DK weight yarn I knew I had solved my problem! But the knot was very small, and would barely cover the crown. So before putting together my submission I knit a second hat in bulky yarn, so I could show the knot in two very different sizes. I had considered adding mittens to my submission, but didn’t because the hat was my first and main goal for this design. 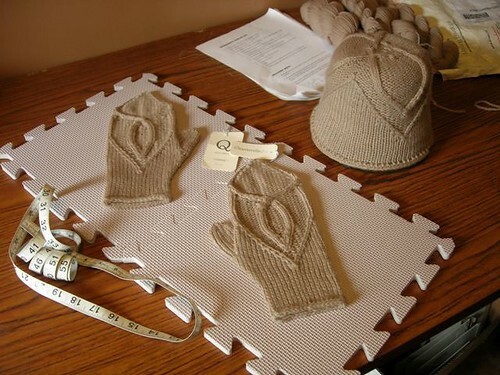 However I wasn’t at all surprised when Kate Gilbert asked if I could add mittens to the pattern to create a set. Of course this provided it’s own challenge. Did I need yet another mitten take on the 3 cornered knot? I decided the mittens should reflect the motif, without mirroring it exactly, in part because I didn’t want to do a third take on that look. 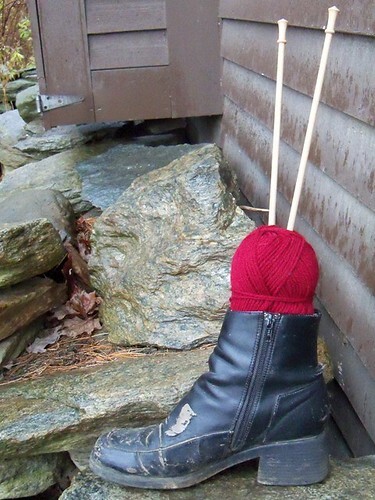 But mostly because the aran weight yarn was too heavy to fit a whole knot on a single mitten! Once I’d finished with knitting the pattern write up provided a whole new challenge. Like many cable designers I work from primarily from charts, and if I include row-by-row directions in a pattern they’re reverse engineered from those charts. 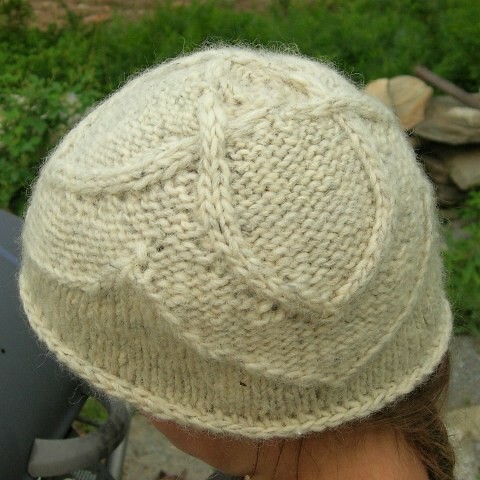 But this hat was different, I worked the knot purely from the image in my mind, and noted my stitches as I went. This means I had the row-by-row directions first! Because of the way the stitches shift from one repeat into another this worked especially well in this instance. However I knew, for many cable knitters, I would need charts in the pattern. As a knitter myself I’ll pass right over a cable project if it doesn’t include charts. But I didn’t want to chart the whole repeat, just the first repeat, so when you’re knitting from the charts pay special attention to the rounds that begin and/or end with those vertical colored lines! I absolutely loved working with Osprey from Quince & Co. It’s very soft without loosing the stretchy bounciness that I love about 100% wool yarns. 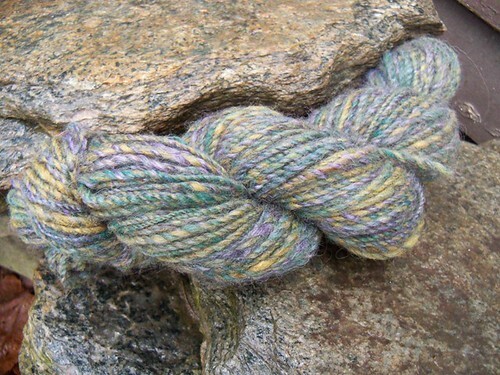 The plied texture shows off stitches and cabling very well. That being said, blocking is completely necessary to make the stitches as even as possible. On that note if you’re having trouble getting gauge on this pattern – Block It. Due to the increases in the cables of the crown of the hat the whole thing will need to be stretched horizontally just a touch during blocking for the fabric to lay flat.